The last great philosopher of the Enlightenment era, and one of the greatest philosophers of all time, Immanuel Kant urged people to "Dare to Know" - "Sapere Aude" that is, to start having an autonomous thinking instead of relying for knowledge on external sources and the authority of others, bringing this way, a new development in the process of philosophical thought, and creating the German schools of Kantianism and Idealism. Kant's transcendental idealism, epistemology and moral philosophy have also influenced Western thought and dominated the intellectual life of scholars and thinkers up to the present day. Kant placed the rational human being at the center of the cognitive process, and managed to bring man's innate forms, ideas and concepts to the experience of the physical world. His studies on both, nature and human nature were also original and thought provoking. Immanuel Kant was born on April 22nd 1724, in Königsberg, the capital city of East Prussia, which is modern day Kaliningrad, the Russian exclave. His father, Johan Georg Kant was a harness maker and his mother Anna Regina Kant, who was an educated lady, was also a harness maker's daughter. At the time Immanuel was born, the family income was steadily decreasing as his father's trade was declining. However, Immanuel had been offered good and moral home education and both his parents were decent, honest and pious people. Kant himself said that he had "feelings of the highest gratitude for his parents," and believed that it was his mother who had laid the foundation for what he later became. 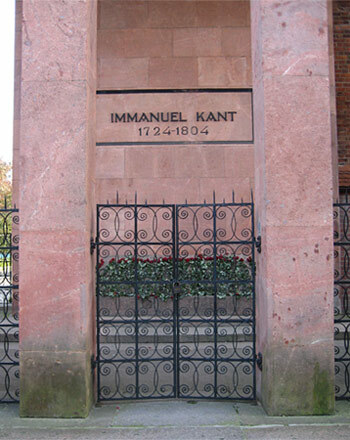 Apart from honesty and hard work, religion also played an important role in the Kant family, and at the age of 8, young Immanuel was sent to Fridericianum College which was a Pietist school, where he studied until the age of 16. Kant was not happy at the Fridericianum College because of the amount of homework, the lack of critical thinking and the strict religious discipline, which is said to have developed in Kant an aversion to organized religion and its practices. 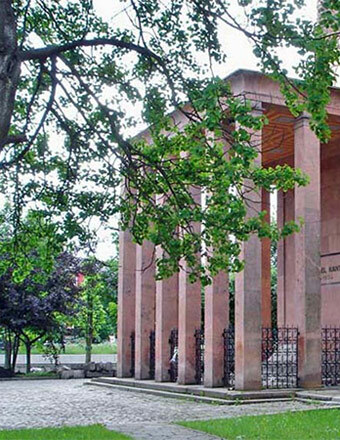 In 1740, Kant entered the Königsberg University where he was free to study any subject he wanted without having to follow any strict discipline or religious rules. He studied physics, mathematics, philosophy and natural sciences. When his father died in 1746, he did not have the necessary financial support to finish his studies and he started working as a private tutor, working among other families, for Count Kayserling's family, through which he became acquainted with several influential people of the upper society of the city. In 1755, he managed to finish his studies and took up a lecturer's position in maths and physics at the Königsberg University. He held this position until 1770, and he had hundreds of students who crowded the halls to attend his lectures as he was a very eloquent speaker, who used vivid examples and a great deal of humor while lecturing. During these years he was mostly science oriented, and published several works on the movement of heavenly bodies, on the different human races, and on the causes of earthquakes, as well as his first work on the principles of metaphysics. In 1770, he was given a professor's chair for logic and metaphysics, which he held until a few years before the end of his life. It was during that period when he published his great works Critique of Pure Reason (1781), Critique of Practical Reason (1788), Critique of Judgment (1790), and hundreds of other astounding works on a variety of topics. Kant lived an uneventful life, never married and never traveled away from Prussia, but he had a good knowledge of other cultures since Königsberg was a multicultural seaport with inhabitants from Holland, France, Poland, Lithuania, Russia and England, in addition to the large Jewish community. In spite of being considered a solitary man, he was a really sociable person as he often invited guests to dinner, enjoyed good company, and loved clever and humorous conversations. It is said that he was so punctual in whatever he did, that local housewives set their clocks at 3:30 every afternoon when he had his usual stroll. 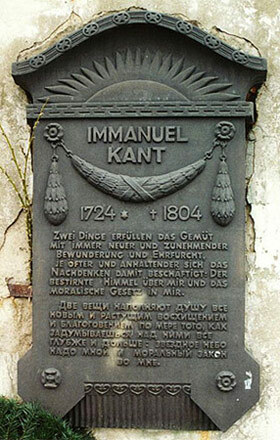 Kant died on the cold morning of February 12th, 1804, but his mind and physical strength had deteriorated so much during the last years of his life that nothing had remained of the genius he had previously been. It is said that he died gently and peacefully and his last words were: "It is good." He was buried in the graveyard of the Königsberg Cathedral and his tomb was inscribed with the closing words of his second Critique: "The starry heavens above me and the moral law within me fill the mind with ever new and increasing admiration and awe, the oftener and the more steadily we reflect on." Kant managed to overcome the dichotomy of philosophical thought between the empiricism of Francis Bacon and the rationalism of René Descartes. Kant saw that both approaches failed because both were based on mistaken assumptions. He saw that the most crucial point was not to make our own concepts match the nature of objects, but allow our own concepts shape the experience of objects. His views appear in his philosophical masterpiece Critique of Pure Reason, in which he tries to prove that it is reason that determines the conditions under which we can acquire knowledge and experience of the world around us. In his Critique, Kant attacked the metaphysics theory of Leibniz and criticized him for his assumption that the human mind has capabilities of reaching truths about different entities, God, immortality and freedom just by pure thought. Kant maintained that the human mind does not have such powers and the Leibnizian metaphysics was just a hoax. In order to support his theory, Kant also used the idea of the synthetic-a priori judgment, which is based only on reason excluding sensory experience, and the analytic-a posteriori judgment, which is substantially more limited and is mainly based on experience. This kind of distinction marked the difference, which had always existed in logic, between necessary and contingent truths. Kant also maintained that the source of morality is Good Will, which could stem from the idea of duty as it is determined by the universal moral law. "Doing the right thing" becomes automatic for any rational being with a Good Will, without expecting to derive pleasure or happiness out of it. In this way all consequences, such as personal gain or avoidance of pain or misery, are absolutely irrelevant. Duty is what makes a man good, and having Good Will makes a man take the right moral decisions without considering factors such as happiness and pleasure or avoiding pain and inconveniences. "So act as to treat humanity, whether in thine own person or in that of any other, in every case as an end withal, never as a means only." All of Kant's ideas had a direct impact on most subsequent philosophical movements, despite the controversies they caused. The transcendental nature of mind which contributes to knowledge, the fact that philosophy itself involves self-criticism, the idea of morality which stems from human freedom, and that autonomous acting means acting according to moral principles, all these have made Kant's philosophy unique, long-lasting, and highly influential on subsequent philosophies. Kant's works are generally agreed to be difficult in reading and understanding, not only to laymen but also to philosophers themselves. Even Karl Popper, the 20th century philosopher and professor at the London School of Economics once remarked: "It was through Schopenhauer that I understood Kant." However, Kant's influence on later philosophical thinking is unparalleled, especially his views on religion caused such a strong reaction and opposition that he was charged with "distortion and depreciation of many leading and fundamental doctrines of sacred Scripture and Christianity," and he was banned from giving lectures on religion. But Schiller, Fichte, Schelling, Hegel and Schopenhauer, all became representatives of Kant's philosophy. Schopenhauer wrote: "Kant's teaching produces a fundamental change in every mind that has grasped it. This change is so great that it may be regarded as an intellectual rebirth. It alone is capable of really moving the inborn realism which arises from the original disposition of the intellect... In consequence of this, the mind undergoes a fundamental undeceiving, and thereafter looks at things in another light." His influence also extended to Nietzsche and from him to modern existentialists, and from Ludwig Wittgenstein to the modern analytic philosophy. We can also trace Kant's influence on Marxism, social and behavioral sciences, in psychology and in the linguistics of Noam Chomsky.